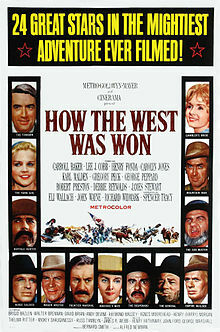 How the West Was Won is a 1962 American Metrocolor epic-western film. The picture was one of the last "old-fashioned" epic films made by Metro-Goldwyn-Mayer to enjoy great success. Set between 1839 and 1889, it follows four generations of a family (starting as the Prescotts) as they move from western New York to the Pacific Ocean. The picture was one of only two dramatic films made in the curved-screen three-projector Cinerama process, which added to its original impact. The all-star cast includes Carroll Baker, Lee J. Cobb, Henry Fonda, Carolyn Jones, Karl Malden, Gregory Peck, George Peppard, Robert Preston, Debbie Reynolds, James Stewart, Eli Wallach, John Wayne, and Richard Widmark. The film is narrated by Spencer Tracy. The score was listed at number 25 on the American Film Institute's 100 Years of Film Scores. The film also gained widespread critical acclaim. In 1997, the film was selected for preservation in the National Film Registry of the Library of Congress as being deemed "culturally, historically, or aesthetically significant". 2.1 Introduced in "The Rivers"
2.2 Introduced in "The Plains"
2.3 Introduced in "The Civil War"
2.4 Introduced in "The Railroad"
2.5 Introduced in "The Outlaws"
The film begins with narration by Spencer Tracy as the aerial-borne camera sweeps over the Rocky Mountains. "This land has a name today," says Tracy in the opening lines of the film, "and is marked on maps." The film then moves into "The Rivers" sequence (considerably to the east of the Rockies). The settlers' raft is caught in rapids. Mountain man Linus Rawlings (Stewart) is making his way by horse and waterway through the mountains. He confers with a group of Indians. The scene then shifts to Zebulon Prescott and his family. Prescott (Malden) and his family set out west for the frontier via the Erie Canal, the "West", at this time, being the Ohio River country, at the southern edge of Illinois. Along the journey, they meet Rawlings, who is traveling east, to Pittsburgh, to trade his furs. Rawlings and Zebulon's daughter, Eve (Carroll Baker), are attracted to each other, but Linus is not ready to settle down. Linus Rawlings stops at an isolated trading post, run by a murderous clan of river pirates, headed by "Alabama Colonel" Jeb Hawkins (Walter Brennan). Linus is betrayed when he accompanies seductive Dora Hawkins (Brigid Bazlen), into a cave, modeled after a real outlaw haunt, now a part of Cave-in-Rock State Park, to see a "varmint". Dora Hawkins stabs him in the back and Rawlings falls into a deep hole. He is not seriously wounded, and he rescues the Prescott party from a similar fate. The bushwhacking thieves (Lee Van Cleef plays one), including Dora Hawkins, are dispatched, being killed in an attack by Rawlings, in a form of rough frontier justice. After Zebulon prays to God for their lost loved ones and commends to Him the thieves' souls "whether You want 'em or not", the settlers continue down the river, but their raft is caught in rapids, and Zebulon and his wife Rebecca (Agnes Moorehead) drown. Linus, finding that he cannot live without Eve, reappears and marries her. She insists on homesteading at the spot where her parents died. This section was directed by Henry Hathaway. The wagon train is attacked by Cheyenne Indians. Eve's sister Lilith (Debbie Reynolds) chose to go back East but after some years finds herself touring in St. Louis, where she and her troupe are hired to perform trendy acts at the Music hall. She attracts the attention of professional gambler Cleve Van Valen (Gregory Peck). After overhearing that she has just inherited a California gold mine, and to avoid paying his debts to another gambler (John Larch), Cleve joins the wagon train taking her there. Wagonmaster Roger Morgan (Robert Preston) and he court her along the way, but she rejects them both, much to the dismay of her new friend and fellow traveler Agatha Clegg (Thelma Ritter), who is searching for a husband. Surviving an attack by Cheyennes, Lilith and Cleve arrive at the mine, only to find that it is worthless. Cleve leaves. Lilith returns to work in a dance hall in a camp town, living out of a covered wagon. Morgan finds her and again proposes marriage unromantically. She tells him, "Not now, not ever." Later, Lilith is singing in the music salon of a riverboat. By chance, Cleve is a passenger. When he hears Lilith's voice, he leaves the poker table (and a winning hand) to propose to her. He tells her of the opportunities waiting in the rapidly growing city of San Francisco. She accepts his proposal. This section also was directed by Henry Hathaway. Linus Rawlings joins the Union army as a captain in the American Civil War. Despite Eve's wishes, their son Zeb (Peppard) eagerly enlists as well, looking for glory and an escape from farming. Corporal Peterson (Andy Devine) assures them the conflict will not last very long. The bloody Battle of Shiloh shows Zeb that war is nothing like he imagined, and unknown to him, his father dies there. Zeb encounters a similarly disillusioned Confederate (Russ Tamblyn), who suggests deserting. By chance, they overhear a private conversation between Generals Ulysses S. Grant (Harry Morgan) and William Tecumseh Sherman (Wayne). The rebel realizes he has the opportunity to rid the South of two of its greatest enemies and tries to shoot them, leaving Zeb no choice but to kill him with the bayonet from his shattered musket. Afterward, Zeb rejoins the army. When the war finally ends, Zeb returns home as a lieutenant, only to find his mother has died. She had lost the will to live after learning that Linus had been killed. Zeb gives his share of the family farm to his brother, who is content to be a farmer, and leaves in search of a more interesting life. This section was directed by John Ford. Following the daring riders from the Pony Express and the construction of the transcontinental telegraph line in the late 1860s, two ferociously competing railroad lines, the Central Pacific Railroad and the Union Pacific Railroad, one building westward and the other eastward, open up new territory to eager settlers. Zeb becomes a lieutenant in the U.S. cavalry, trying to maintain peace with the Indians with the help of grizzled buffalo hunter Jethro Stuart (Fonda), an old friend of Linus'. When ruthless railroad man Mike King (Widmark) violates a treaty by building on Indian territory, the Arapahos retaliate by stampeding buffalo through his camp, killing many, including women and children. Disgusted, Zeb resigns and heads to Arizona. A subplot was cut featuring Hope Lange as Stuart's daughter, Julie, who becomes involved in a love triangle with Zeb and King; she ultimately marries and abandons Zeb. This section was directed by George Marshall. In San Francisco, widowed Lilith auctions off her possessions (Cleve and she had made and spent several fortunes) to pay her debts. She travels to Arizona, inviting Zeb and his family to oversee her remaining asset, a ranch. Zeb (now a marshal), his wife Julie (Carolyn Jones), and their children meet Lilith at Gold City's train station. However, Zeb also runs into an old enemy there, outlaw Charlie Gant (Wallach). Zeb had killed Gant's brother in a gunfight. When Gant makes veiled threats against Zeb and his family, Zeb turns to his friend and Gold City's marshal, Lou Ramsey (Lee J. Cobb), but Gant is not wanted for anything in that territory, so Ramsey can do nothing. Zeb decides he has to act rather than wait for Gant to make good his threat someday. Suspecting Gant of planning to rob an unusually large gold shipment being transported by train, he prepares an ambush with Ramsey's reluctant help. Gant and his entire gang (one member played by Harry Dean Stanton) are killed in the shootout and resulting train wreck. In the end, Lilith and the Rawlings family travel to their new home. A short epilogue shows modern Los Angeles and San Francisco in the early 1960s, including the four-level downtown freeway interchange and Golden Gate Bridge. Introduced in "The Civil War"
The film marked then 66-year-old Raymond Massey's last appearance as Abraham Lincoln, a role that he previously played on stage (Abe Lincoln in Illinois and the stage adaptation of John Brown's Body), on screen (Abe Lincoln in Illinois), and on television (The Day Lincoln Was Shot, and two more productions of Abe Lincoln in Illinois). MGM had enjoyed a great success with the big screen remake of Ben-Hur (1959) and initiated a number of spectacles, including remakes of Cimarron, Four Horsemen of the Apocalypse, and Mutiny on the Bounty. In 1960, MGM struck a deal to make four films with Cinerama, and Bing Crosby approached them with a proposition. He was developing a television spectacular called How the West Was Won based on photographs of the Old West in Life, with profits to go to St. John's Hospital, along with an album inspired by the same article recorded with Rosemary Clooney. MGM bought the film rights from Crosby. The project was announced by MGM in June 1960, originally called The Great Western Story. The plan was to film a story of six segments featuring 12 stars, with a linking overall storyline. Among the historical personae to be featured were Buffalo Bill, the James brothers, and Billy the Kid. A portion of the profits would go to St. John's Hospital. This led Irene Dunne and others to persuade the movie's stars to take less than their usual fees. However, the hospital later sued for a share of the film's profits. Bernard Smith was assigned as producer, and he hired James Webb to write the script. George Peppard was announced as the lead in October 1960, and Irene Dunne and Bing Crosby were originally announced as stars. Laurence Harvey and John Wayne were also going to appear in one sequence together. By April 1961, John Wayne and Spencer Tracy had confirmed their plans to play Generals Sherman and Grant for a segment directed by John Ford, and James Stewart had been signed as well. Other roles would go to Gregory Peck, Debbie Reynolds, Russ Tamblyn and Carroll Baker, while Henry Hathaway and George Marshall would also direct, from a script by James Webb. Bing Crosby was slated to provide narration. Jim Hutton was meant to appear in the Civil War segment. Eventually, Harry Morgan appeared as Grant when Tracy was unavailable. Ultimately, the film contained five sections: the 1830s migration, the 1840s gold rush, the Civil War, the construction of the railroad, and the "taming" of the Wild West, with one family's story over three generations providing the bridge between each time period. The budget was set to at least $8 million. John Ford directed the Civil War segment, George Marshall the railroad segment, and Henry Hathaway the rest. "We wanted three old pros, no young geniuses," said Smith. How the West Was Won was one of only two dramatic feature films (the other being The Wonderful World of the Brothers Grimm) made using the three-strip Cinerama process. Although the picture quality when projected onto curved screens in theatres was stunning, attempts to convert the movie to a smaller screen suffer from that process's technical shortcomings. When seen in letterbox format, the actors' faces are nearly indistinguishable in long shots. Filming started in May 1961 by John Ford in Paducah, Kentucky. Producer Smith said, "it is essential for our purposes that virtually the whole movie be shot outdoors. Throughout the movie, one of the basic themes is to show little people against a vast country – huge deserts, endless plains towering mountains, broad rivers. We want to capture the spirit of adventure, the restless spirit that led these men and women across the country in [the] face of many difficulties and dangers." After Ford finished his segment, Hathaway took over on location. Parts of the film were shot in Monument Valley, Utah. Parts of the film were also shot in Wildwood Regional Park in Thousand Oaks, California. Ford complained about having to dress such huge sets, since Cinerama photographed a much wider view than the standard single-camera process to which Hollywood directors were accustomed. Director Henry Hathaway was quoted as saying, "That damned Cinerama. Do you know a waist-shot is as close as you can get with that thing?" A more difficult problem was that the film had to be shot with the actors artificially positioned out of dramatic and emotional frame, and out of synchronization with one another. Only when the three-print Cinerama process was projected upon a Cinerama screen did the positions and emotions of the actors synchronize—such as normal eye contact or emotional harmony between actors in a dramatic sequence. Because of the nature of Cinerama, if the film were shown in flat-screen projection, it would appear as if the actors made no eye contact, at all. One brief scene of Mexican soldiers was generously sourced by John Wayne from the 1960 version of The Alamo, in which he starred, produced, and directed. Stuntman Bob Morgan, husband of Yvonne De Carlo, was injured seriously and lost a leg during a break in filming a gunfight on a moving train while filming "The Outlaws" portion. Chains holding logs on a flat-bed car broke, crushing Morgan as he crouched beside them. In a scene in which George Peppard's character reminisces about his late father, Peppard improvised by doing an imitation of James Stewart's voice. Director John Ford initially objected, but Peppard felt it was important in such a long, sprawling film to remind the audience which character his father was supposed to be. Hathaway later said making the film was "goddam trouble. They had an idiot for a producer and Sol Siegel was drunk most of the time. We spent so much money on the picture they almost decided not to do the last part. We had a meeting, and I said, 'You can't quit. You've got to show how the West was won. The West was won when the law took over'." Filming was finished in January 1962. After the film was shot, MGM ordered a new ending which rounded out the story of the family and involved shooting for another month. Henry Fonda and Debbie Reynolds were involved in this. The budget eventually reached $12 million. The film later inspired a television series of the same name. The music for the film was composed and conducted by Alfred Newman. The soundtrack album was originally released by MGM Records. Dimitri Tiomkin, well known for scores to Western films, was the first composer approached to compose the music for the film. However, Tiomkin became unavailable as a result of eye surgery, and Newman was hired as a replacement. The score is widely considered to be one of Newman's best, and appears on the AFI's 100 Years of Film Scores list. It was nominated for the Academy Award for Best Original Score, losing to Tom Jones. Debbie Reynolds sings three songs in the film: "Raise a Ruckus Tonight" starting a party around the camp fire, "What Was Your Name in the States? ", and "A Home in the Meadow" to the tune of "Greensleeves", with lyrics by Sammy Cahn. Her rendition is heard by Cleve (Gregory Peck), who is so moved he proposes marriage. This scene ends The Plains segment. Surprisingly for such an American film, How the West Was Won had its world premiere in the United Kingdom at London's Casino Cinerama Theatre on November 2, 1962. The film ran at the Casino for 123 weeks, ending in April 1965. How the West Was Won was a massive commercial success. Produced on a then-large budget of $15 million, it grossed $46,500,000 at the North American box office, making it the second-highest-grossing film of 1963. The film has grossed over $50 million worldwide. In 2000, MGM gave Crest Digital the task of restoring the original Cinerama negative for How the West Was Won. As part of the process, they built their own authentic Cinerama screening room. There have also been efforts, led by HP, to combine the three image portions to make the Cinerama image look more acceptable on a flat screen. This has finally been accomplished on the latest DVD and Blu-ray Disc release. Previously, the lines where the three Cinerama panels joined were glaringly visible (as seen in the stills on this page), but this has been largely corrected on the Warner Bros. DVD and Blu-ray Disc—though the joints remain visible in places, especially against bright backgrounds. The restoration also corrects some of the geometric distortions inherent in the process. For instance, in the final shot, the Golden Gate Bridge appears to curve in perspective as the camera flies underneath it, whereas in the Cinerama version, it breaks into three straight sections at different angles. The Blu-ray Disc also contains a "SmileBox" version, simulating the curved-screen effect. Though the aspect ratio of Cinerama was 2.59:1, Warner's new BD and DVD releases of the film offer an aspect ratio of 2.89:1, incorporating image information on both sides that was never meant to be seen when projected. The BD-exclusive SmileBox alternative has the intentional cropping intact. In 2006, Warner Bros. Motion Picture Imaging performed digital restoration on How the West Was Won. The film was restored frame by frame at Prasad Corporation to remove dirt, tears, scratches, and other damage—restoring the original look. The restored version has been shown on television since October 2008, on the Encore Westerns channel. ^ Andrea LeVasseur, Allmovie. "How the West was Won – Synopsis". amctv.com. ^ a b c Box Office Information for How the West was Won. IMDb via Internet Archive. Retrieved June 17, 2018. ^ Variety film review; November 7, 1962, page 6. ^ Pylant, James (2012). In Morticia's Shadow: The Life and Career of Carolyn Jones. Jacobus Books. p. 116. ^ "HOW THE WEST WAS WON: DELETED SCENES". HOW THE WEST WAS WON: The Making of MGM's classic Cinerama epic movie. ^ Illness Will Force Decision on 'Hush': Picture May Be Called Off; Loretta Young Refuses Lead Hopper, Hedda. Los Angeles Times (1923-Current File) [Los Angeles, Calif] 07 Aug 1964: C10. ^ "Conejo film fest highlights Westerns". Thousand Oaks Acorn. November 12, 2015. ^ Take One. Unicorn Pub. 1976. p. 11. Retrieved 14 September 2018. That Goddamned Cinerama; do you know that a waist shot is as close as you can get with that thing? ^ "How the West Was Won". Snopes.com. Retrieved 2014-05-14. ^ Davis, Ronald L. (2005). Just Making Movies. University Press of Mississippi. p. 150. ^ "How The West Was Won: the lyrics to the songs". Retrieved 2016-12-28. ^ "The 36th Academy Awards (1964) Nominees and Winners". oscars.org. Retrieved 2011-08-23. ^ "NY Times: How the West Was Won". NY Times. Retrieved 2008-12-25. ^ "AFI's 100 Years of Film Scores" (PDF). American Film Institute. Retrieved 2016-08-14. ^ "Cinerama Dome Moves Forward". Hollywoodheritage.org. Archived from the original on 2013-05-12. Retrieved 2014-05-14. ^ "HP Labs - Movie makeover : HP and Warner Bros. give old movies new life". www.hpl.hp.com. ^ "economictimes, Strategic alliance for creation of digital intermediaries, Dec 17, 2007". ^ "Warner bros., Prasad Corp form strategic alliance | News". Glamsham. ^ "prasadgroup.org, Digital Film Restoration" (PDF). Archived from the original (PDF) on October 13, 2014. ^ "Gold Key: How the West Was Won". Grand Comics Database. Wikimedia Commons has media related to How the West Was Won (film).